RECENT UPDATE: Facebook’s Newsfeed algorithm no longer penalizes 3rd party tools when they post on Facebook, although it is recommended that you post from both Facebook & third party tools when possible. Here are a few articles on the subject from a variety of industry experts: Social Mouths, EdgeRank Checker & Mari Smith. Everyone uses them right? Social media tools like TweetDeck, Co Tweet, Sprout Social, HootSuite and others have become widely adopted. They are a great asset for managing your social media presence across multiple platforms and accounts. The main benefit of using these tools is they make managing social media much more convenient. One of the best things about these tools is the ability to schedule your posts ahead of time. I use HootSuite everyday to schedule my tweets and interact with users on our various social media accounts. Many also use HootSuite and the other tools to schedule their Facebook posts on their Pages, which is actually a bad idea. This is one instance when convenience limits the amount of people seeing and interacting with your Facebook Page. It’s a darn shame, even I was mad when I found out because who doesn’t like to make things easier! The screen shots below were taken from my news feed today and they help illustrate how third party tools actually hide your posts sometimes. Let’s look at this example from the screen shots. So let’s pretend I’m a typical user, first I log into my Facebook account and see this in my news feed. It’s an update by Sprout Social, a newer social media engagement platform, posting about a test they are performing. I may click the link, like the post, leave a comment or continue browsing. However, if you look directly below the post there’s a link that reads “See 2 more posts from Sprout Social.” Most likely I go about my typical Facebook browsing and stalking, never thinking twice about clicking this See More button. What posts am I not seeing? ^This must be clicked to show items hidden from view. 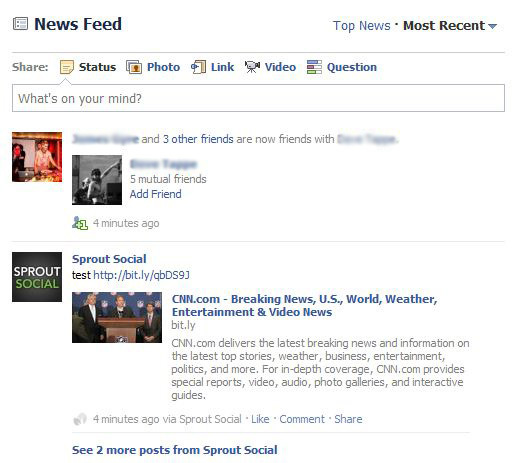 By clicking this button you can see the rest of the recently posted content by the Sprout Social app being used by multiple Pages on Facebook. The algorithm that determines what is seen in Facebook’s news feed bunches together postings from applications on Facebook. To be able to post on Facebook, third party tools create these apps as a means of managing a Facebook Page. Look below to see what content was hidden from the news feed after I clicked the See More button. Voila! 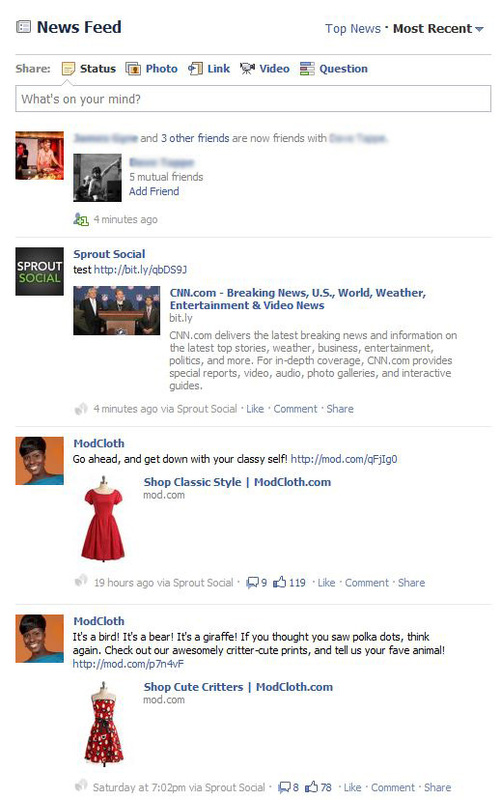 Two posts from the lovely ladies at ModCloth were completely hidden from news feed until I clicked that button. If I were a typical user would I have seen those posts? The answer is yes and no. It depends on when I log in as compared to when the update was posted, but at that moment in time when I logged in those posts were hidden. ModCloth and other brands using these convenient functions are well followed and still receive engagement from these posts because they aren’t completely hidden and their audiences are engaged. However, it’s not worth hiding your posts from some possible visitors by adding another click for them to see your content. Therefore, continue to use your third party tools as you see fit. I use these tools to engage with my social accounts, but just not to post on Facebook. I recommend just posting manually for the time being until Facebook makes a change to the algorithm correcting this problem if they ever deem it necessary. If you look at all of Target’s Facebook posts they say via Target with their logo. This is great for branding purposes, instead of saying via CoTweet or HootSuite. This custom platform created for Target allows them to schedule posts, but prevents their posts from being hidden in the same way via the News Feed. However, posts from Target, since they are through a third party application, are still grouped together in the News Feed. Yet, they don’t stand the same risk of being hidden because they aren’t grouped with posts from other Pages. This ensures that if Target’s posts become grouped in the News Feed, the very first post shown will be a post from Target. Therefore, using a custom third party tool is one workaround. The only downside to this is that it needs to be designed in-house or bought from an agency, which is going to be fairly expensive. However, i’m sure a few agencies providing these kinds of tools have the ability to white label their platform for your brand, skipping the development phase all together. Was this a helpful insight? Are you mad that you shouldn’t schedule your posts?